Edward Kozak was born 26 January 1902, in Hirne, Stryi county, Galicia. Caricaturist, illustrator, and painter; feuilletonist, satirist, writer, and editor. He studies at the Vienna Art School (1917) and O. Novakivsky's art school in Lviv (1926), illustrated and edited the satirical periodical Zyz (1926-1933) and Komar (1933-1939) in Lviv, and illustrated the children's magazines Svit dytyny, Dzvinochok (1931-1939), and Iuni druzi (1933-1934) and the books published by I. Tyktor. At the same time, he painted and participated in the exhibitions of the Association of Independent Ukrainian Artists (1933-6) in Lviv. Emigrating to Germany at the end of the Second World War, he founded the humor magazine Lys Mykyta (1948) and headed the Ukrainian Association of Artists (USOM). In 1949 he settled in the United States, where he worked in animated television films, receiving an award for his work from the National Educational Association in 1957. He resumed publishing Lys Mykyta in 1951, and exhibited his paintings in Detroit, Chicago, Buffalo, Toronto, Edmonton, and Hunter (New York). For a time he illustrated the children's magazine Veselka. 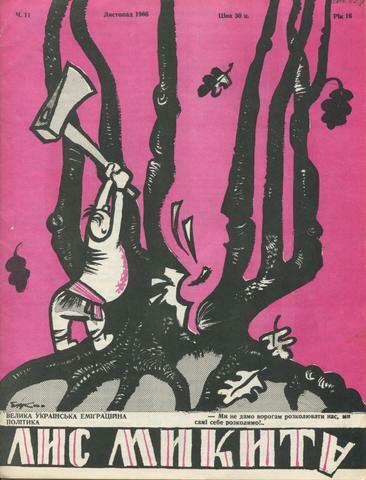 Kozak is best known for his satirical drawings and writings, which amount to a running commentary on political and social developments in the Ukrainian community for over half a century. His caricatures of J. Stalin, which were reprinted in the German, French, Italian, English, Dutch, Polish, and Yugoslavian press, are recognized classics in the field. Many of his paintings deal with folk motifs and display a light-hearted humor and expressive colors; eg, The Market, Sich, Old Inn, and Village. He has published two albums of drawings with witty captions: Selo (The Village, 1949) and EKO (1949). As a satirical writer, he has created the incisive peasant philosopher Hryts Zozulia, under whose name he has published two collections of humorous sketches: Hryts' Zozulia (1973) and Na khlops'kyi rozum Hrytsia Zozuli (According to Hryts Zozulia's Common Sense, 1982). He has written numerous feuilletons and verses under different pen names. Some of the verses are printed in the collection Virshi ironichni, satyrychni i komichni (Ironic, Satiric, and Comic Verses, 1959). Issues of Lys Mykyta periodical were collected by Orysia Tracz. The collection consists of 147 issues of the satirical and humour magazine "Lys Mykyta" published in Detroit by Edward Kozak. He started publishing it in 1948, after he emigrated to Germany after the WWII. In 1949 he settled in the United States, and resumed publishing Lys Mykyta in 1951.